The US regulator is to beef up its procedures for overseeing the safety of drugs already in the marketplace. The Food and Drug Administration announced on Tuesday it will create an independent drug safety oversight board. The regulator has been criticised in recent months for failing to act on evidence that a leading painkiller may be linked to heart problems. The drug, Vioxx, was withdrawn from the market last September. Research suggested the painkiller - used by two million people worldwide at the time it was withdrawn - doubled the risk of cardiac arrest. Doctors in the UK have linked 103 deaths to patients taking the drug, which has mainly used to treat the pain associated with arthritis. An FDA scientist told a Senate inquiry in November that the regulator had been guilty of a "profound regulatory failure". Dr David Graham said he had felt pressured to water down findings from a study linking the drug to greater chances of heart attacks. According to Dr Graham's calculations, Vioxx may be linked to as many as to 56,000 American deaths. Research published by The Lancet medical journal, also in November, highlighted a study by the University of Berne in Switzerland which found serious question marks over the safety of the drug dating back to 2000. 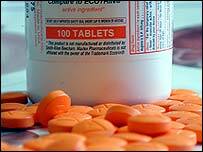 The Lancet concluded that the drug should have been taken off the market years before it was finally withdrawn. Editor Dr Richard Horton said: "The licensing of Vioxx and its continued use in the face of unambiguous evidence of harm have been public health catastrophes." The decision to set up a new drugs watchdog comes on the eve of a three-day FDA meeting to discuss the safety of Vioxx and other drugs in the same class, known as Cox-2 inhibitors. The board will include representatives from the FDA and medical experts from other agencies like the Veterans Administration. It is expected to take steps to make the FDA's decision-making process on drugs more open and make sure drugs on the market are as safe as possible. These will include a new drug safety web page with emerging information on side effects, and safety risks. One-page information sheets for health care professionals and another for patients also will be made widely available. Announcing the change, Mike Leavitt, the US House and Human Services Secretary, promised a new "culture of openness." The FDA already has an Office of Drug Safety but consumer groups and some lawmakers have said it lacks sufficient independence and resources. Vioxx was licensed in April 1999 with claims that it was safer than traditional painkillers, such as ibuprofen and diclofenac. Since the drug was withdrawn concerns have been expressed about other Cox-2 inhibitors. The UK's Medicines and Healthcare products Regulatory Agency (MHRA) has advised patients to make a non-urgent appointment with their GP to have their treatment reviewed. This advice applied to patients taking Celebrex, Bextra and Arcoxia.